Nobody expects bobbleheads to look like their real-life counterparts, especially at the minor league level. The Sacramento River Cats' 2013 Barry Zito bobblehead looks nothing like the southpaw pitcher. The figurine is more generic Sims avatar than Zito, sporting a patchy beard that looks as if it were tattooed rather than grown. The giveaway could've been a stand-in for any dark-haired baseball player, really. But look a little bit farther down, knowing that it's supposed to be the famous Oakland A’s pitcher, and the true issue emerges. Zito made a name for himself as one the game's best lefties in the early 2000s, winning the Cy Young Award in 2002 for the River Cats' then-parent club, the Oakland Athletics. Look at the glove: It's on generic Sims-man Zito's left hand, making this stand-in a right-handed pitcher. The same pitcher the New York Times called "A Lefty's Lefty" depicted as one of the 90 percent plebeians, the right-handers. A month before the promotion, a member of the River Cats' front office spotted the mistake, according to a source, and pointed it out to the marketing department. "Nobody will notice," marketing said. "It's Barry f--king Zito," the staffer said. "Of course they'll notice." They noticed, because the mistake was as bad as making a right-handed bobblehead for Hall of Famer Lefty Grove. The promotional blunder made the rounds on the internet. "Worst bobblehead ever," USA Today's For The Win noted. "Right-handed. Oops," one tweeter wrote. "What's wrong with his face?" another added. The mistake was so bad that less than a year later, when one fan inquired on Twitter about a Barry Zito bobblehead, the official River Cats' account tweeted back: "Barry Zito bobblehead night was last year, and it was right-handed. That was a fun day." Bad bobbleheads, however, are as much a part of baseball's culture as any other promotion in sports. The San Francisco Giants gave away the first promotional bobblehead in 1999, Willie Mays, commemorating the last year at Candlestick Park. Mario Alioto, the executive vice president at the time, proposed the idea. "The early editions looked nothing like the bobbleheads we see today," says Faham Zakariaei, Giants senior director of promotions and special events. "It was really thin; the head was not extravagant or large. We asked them to make it more like the ones you'd see in store." For a long time, most bobbleheads resembled their real-life counterparts as much as the Tom Brady Deflategate courtroom painting did the New England Patriots quarterback. But the Los Angeles Dodgers, a team that produces more bobbleheads than most other Major League teams, has also managed to make theirs some of the most accurate in professional sports. "The Dodgers are at the top of the game when it comes to likeness for their bobbleheads," says Phil Sklar, co-founder and CEO of the National Bobblehead Hall of Fame and Museum. "They've been one of the top teams we've seen with those features. If you rush them, the quality will be poor because they are hand-sculpted with the molds." The Dodgers start planning their promotional calendar in November after the season, going through their roster, with recommendations from their vice president and chief marketing officer, before approaching the player. Some teams, like the Giants, start building out their promotional calendar as early as August. From there, the team commissions the promotional company to create a mold, often going through four or five rounds of revisions before painting starts. The team and promotional company will often look through hundreds of photos, pinning down details from Vin Scully's lapel pin to Julio Urias' glasses. Every bobblehead is handpainted, requiring a significant amount of preparation for the manufacturer. According to multiple executives, this is the step where things can often go wrong, when the mold of the figurine often looks completely different once painted. Jay Deutsch, CEO and co-founder of BDA, the nation's largest producer of promotional sports items, says the company produces nearly six million bobbleheads annually, taking on 300 to 400 projects at $3 to $4 a figurine on average. The Dodgers, Deutsch says, are among his most meticulous clients. "Each team tries different things, and the Dodgers have stayed true to form with the way theirs look. I like the fact that with bobbleheads you can do super-themed, and the Dodgers, in true Dodgers form, stay super-traditional," Deutsch says. "The Dodgers are very protective about that." While the Dodgers have decided to stick with more traditional bobbleheads—throwing, hitting, standing—others have taken more creative measures. In the last five years, teams around baseball began branching out with a variety of more creative bobbleheads. The Giants gave away a Johnny Cueto bobblehead whose torso shook, recreating his signature shimmy on the mound, while the New York Mets gave away a Noah Syndergaard figure that put the flamethrowing righty in a literal Thor costume, licensed by Marvel, the first for a major league team. Other clubs celebrate famous fans, like the St. Louis Cardinals, who created a bobblehead of actor Jon Hamm. "A good bobblehead is getting a likeness close, which is a factor. But it's also about building something that's unique and captures the imagination of people and brings back special memories," Sklar says. "Fans will come to a game for any bobblehead, but if teams are giving away several bobbleheads throughout the year, they'll become more selective towards the more unique ones with a special pose." Once the Giants identified Cueto as a player they wanted to "bobblehead," they brainstormed creative routes to memorialize their star pitcher. "Our headspace was that Johnny Cueto was a pretty unique guy and a special player," Zakariaei says. "The fact that he does that shimmy, it's an unheard of thing in baseball in terms of a pitcher. We wanted to integrate that into the tease." Bobbleheads can also have a direct impact on ticket sales. Several executives mentioned that demand for tickets always goes up the night of bobbleheads giveaways, usually on weekends when more families come to games. Fans come earlier to games to pick up their collectable and, as a result, spend more money on merchandise and concessions. Bobbleheads are the number one driver of ticket sales, according to Sklar. Chris Cameron, vice president of communications & fan experience for the Portland Sea Dogs, saw this direct impact on sales when the team announced a ticket package around a three-bobblehead set commemorating the Red Sox's Win, Dance, Repeat victory celebration, hoping to create a collector's item. Cameron noticed that Mookie Betts, Jackie Bradley Jr. and Andrew Benintendi all came through Portland, creating a reason to memorialize a signature part of the 2016 Red Sox season. The three-piece set lists on eBay for nearly $500, with individual figures ranging from $50 to $75. "When we first posted in social media, it blew up, and we love seeing that attention on social media. The first question I asked was, 'We've seen the attention, but was it actually translating into ticket sales?'" Cameron wondered. "I checked with our ticket office, and indeed, we saw a pretty good spike in sales within 24 hours of the social media post. I'd say we probably sold upwards of 100-plus tickets in a 100-hour span, which is pretty good for a minor league baseball team for a single game." Bad bobbleheads still get headlines. The handcrafted and painted nature of each individual item creates room for error. Other times, lack of preparation or a time crunch will force teams to rush out a bobblehead that looks more like a 2K MyPlayer than an actual human. For many teams, it's about striking the balance of getting them right and getting them produced on time. "It's a tricky thing because you approve the bobblehead based off the mold, which is unpainted, so some of the base-level features may not be as easy to tell when it's unpainted versus painted," Sklar says. "A lot of the time, in the process with teams, people will get the molds approved and the face may not look great. The eyes might be off, but it might be something that was hard to tell during the production process." Through all the fads—snow globes, Beanie Babies, fanny packs—bobbleheads have stuck around baseball for nearly 20 years as the quintessential giveaway item. 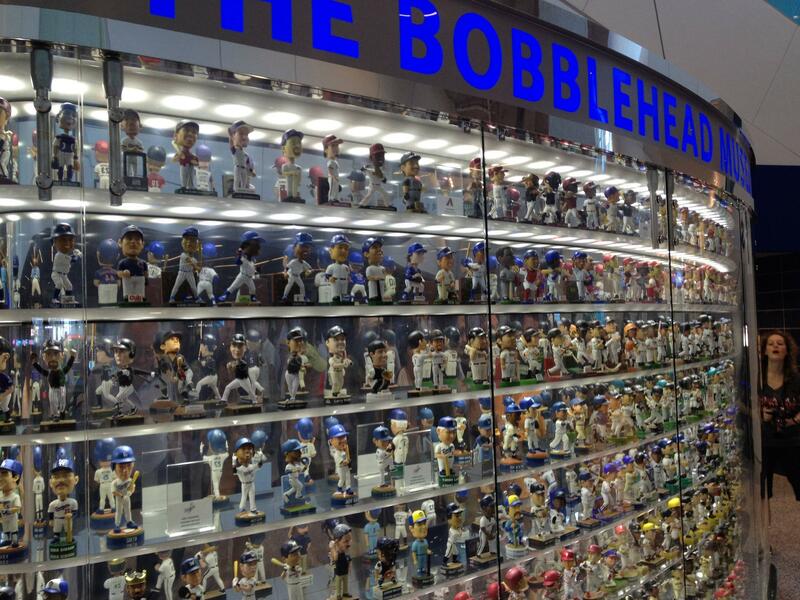 Dodgers Vice President of Marketing and Broadcasting Erik Braverman says he regularly gets photos from fans who've created their own museums from the team's bobbleheads. Mets Marketing Director Mark Fine says the urgency of getting to the gate for bobblehead night creates a different energy at the ballpark. It's an energy that Syndergaard says is one of the best parts of becoming a bobblehead, regardless of its likeness accuracy. "At the end of the day," Syndergaard says, "who doesn't want to be a bobblehead?"